‘The Lord Said to My Lord…’ To Whom Was the Lord Speaking in Psalm 110:1? A coworker and friend of mine, who I know is a fundamentalist Christian, recently asked me what Jews think about the Trinity. I told him that the concept is not part of our religion and that Jews believe in only one God. He went on to ask me to explain Psalm 110 to him, which starts in English, “The Lord said unto my Lord…” To him this is yet another proof of the trinity. I could not give him an answer to his question. Would you please explain the meaning of this. Psalm 110 represents one of the New Testament’s most stunning, yet clever, mistranslations of the Jewish Scriptures. Moreover, the confusion created by the Christianization of this verse was further perpetuated and promulgated by numerous Christian translators of the Bible. As you will soon see, some Christian translators, to their credit, refrain from manipulating this text in Psalm 110. Although, as you will soon understand, the above conversation could not have occurred, this narrative has been replayed over and over again in the imagination of countless Christians for nearly two millennia. In the Christian mind, this was a terrific triumphant story. Jesus really showed those arrogant Pharisees how little they knew about their own Bible! Yet, this is precisely why this story never transpired. No Jew armed with a superficial knowledge of this chapter would have ever found Jesus’ argument compelling, let alone a conversation-stopper. The depth of knowledge that the Pharisees possessed of Tanach was astounding. Is the above verse speaking about the messiah? Not at all. Yet look at the first and second word “Lord” in the verse (they are side by side). Were you able to detect any difference between these two words in this fundamentalist Bible? In the “translation” they appear virtually identical because the Christian translator cleverly masked the text of the original Hebrew. Although the two English words in the KJV translation were deliberately made to appear virtually identical, in the original Hebrew text they are entirely different. Whereas the first word “Lord” in the Hebrew is a correct translation of יהוה, which is the Tetragrammaton (YHWH), the ineffable name of God, the second word “Lord” is a complete and deliberate mistranslation of the text. The second word “Lord” in the verse is an appalling translation of the Hebrew word לַאדֹנִי; (pronounced ladonee). The correct and only translation of ladonee is “to my master” or “to my lord.” The Hebrew word adonee never refers to God anywhere in the Bible. It is used only to address a person, never God. That is to say, God, the Creator of the universe, is never called adonee in the Bible. There are many words reserved for God in the Bible; adonee, however, is not one of them. To illustrate this vital point, let’s examine other places in the Bible where the exact same Hebrew word appears and find out how the same New American Standard Bible translates it there. Bear in mind, in none of the following examples do the Christian Bibles have any incentive for mistranslating the word adonee. The Hebrew word לַאדֹנִי; (ladonee) used in the above two verses is referring to Abraham and Esau, respectively. Notice that the Hebrew word used in both verses is identical to the Hebrew word in Psalm 110:1. Why did the King James Version translate לַאדֹנִי; correctly in Genesis 24:54 as “to my master,” or in Genesis 32:4 as “to my lord,” yet deliberately mistranslate Psalm 110:1 as “Lord”? Why do most Christian Bibles make not distinction between those two words, as they do in each and every other place they appear in the Tanach? The answer is obvious. Both Genesis 24:54 and Genesis 32:4 are not texts used by the Church to “prove” Jesus from the Jewish Scriptures and therefore they had no incentive to tamper with them. Psalm 110:1, on the other hand, is a passage flaunted by the New Testament and its missionaries as a verse that they argue “unquestionably points only to Jesus,” and was deliberate mistranslated. Some Christian translations are more transparent in their rendering of Psalm 110 than the New American Standard Bible. For example, the King James Version and a few other Bibles still render the second “Lord” as if it were sacred; however, they translate the first “LORD” in upper case. This is a helpful hint to the keen observer that there is a distinction between them. Of course, it’s up to the curious Bible student to then look up the second “Lord” in a Hebrew Bible. Only a careful investigation of the original Hebrew text would reveal how this verse was doctored. It should be noted that while many Christian translators indulge in this manipulation of Psalm 110:1, some refrain from engaging in this practice. 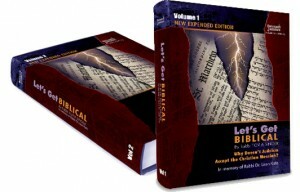 Numerous modern Christian Bibles have corrected Matthew’s mistranslation. For example, the Revised Standard Version and the New English Bible correctly render the Hebrew word ladonee as “ to my lord,” in Psalm 110:1, clearly indicating that this word is not speaking of God. As mentioned above, this tampering with Psalm 110:1 began at the time the Christian Bible was written. The Christian translators, who would later also mistranslate this verse, simply followed in the footsteps of the author of the first Gospel. If we look at the original Greek of Matthew 22:44 we find the same doctoring of the text in later Christian translations of the Book of Psalms. When Matthew has Jesus quote Psalm 110:1 to the Pharisees, the identical Greek word κύριος2 (kurios pronounced koo-re-os) is used both times the word “Lord” appears in Matthew 22:44. Finally, it is essential that we explore the meaning of Psalm 110:1. Of whom is this Psalm speaking? To whom are the words “my master” or “my lord” referring? The Psalm begins with the opening Hebrew words מִזְמוֹר לְדָוִד(Mizmor l’David).” The word “Mizmor” means “a song,” and thus the opening phrase of this Psalm is, “A Song of David.” In fact, the word Psalms comes from the Greek word ψαλμός (psalmos), which means “a song.” Bible students are often unaware of this. Why would King David be writing these songs? For whom was he writing them? Who did King David intend to sing these songs? With these questions in mind, we can begin to understand the meaning of Psalm 110. One of King David’s greatest disappointments was God’s refusal to allow him to build the first Temple in Jerusalem. Although David’s son Solomon undertook that task, and eventually constructed the first Temple, David’s umbilical connection to Solomon’s Temple was significant. For the Church, however, the Psalmist’s original intent was set aside because it was zealously committed to Christianizing this verse. Thus, the opening verse in Psalm 110 was altered in order to paint Jesus into the Jewish Scriptures. Here is some advice. The only way to recognize rampant Christian tampering of the Bible is to read the passage in the original Hebrew language, without the biased filter of the Christian translator. Therefore, give your children a good Jewish education. Remember, the success of groups like Jews for Jesus represents the unpaid bills of the Jewish people. Have Christians Discovered the Doctrine of the Trinity in the Shema prayer?